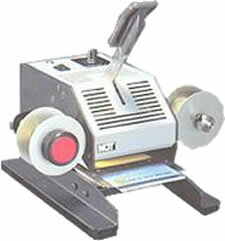 The CM30 Tipper is designed for use in applying a single color to the top of the embossed characters on a plastic card. The tipping color makes the cards more attractive and easier to read. The tipping foil comes in easily changed rolls and is available in several colors the most popular of which are black, silver, gold and white. The CM30 tips in a financial card format - where data is in the lower half of the card similar to a standard credit card. To tip a card the operator simply places a card on the tray and presses down on the handle. This allows the operator to be in full control of pressure and duration during the tipping process. Temperature is adjusted by a control knob on top of the tipper. Tipping foils may be ordered separately.